Marc Raimondi, the national security spokesman at the Department of Justice, confirmed to TheDCNF that Sberbank never registered with the department under FARA. It did not directly register nor was it registered through any other agency such as the Podesta Group. “The FARA Registration Unit personnel conducted a search related to your questions and can confirm that the search terms — Sberbank CIB USA, Inc., or Sberbank — are not currently (nor previously have been) registered under FARA,” he informed TheDCNF in an email. The lobbying group of Manatos & Manatos — Podesta’s competition — did register with the Justice Department under FARA when it agreed to represent VTB Capital, Russia’s second largest bank. That justification was flatly rejected by Ronald A. Oleynik, a partner at the Holland & Knight law firm, who represents foreign clients that face economic sanctions imposed by the U.S. government like Sberbank and VTB Capital. “FARA is quite clear you can’t hide behind the fact that the U.S. subsidiary hired us rather than the foreign parent,” Oleynik told TheDCNF. 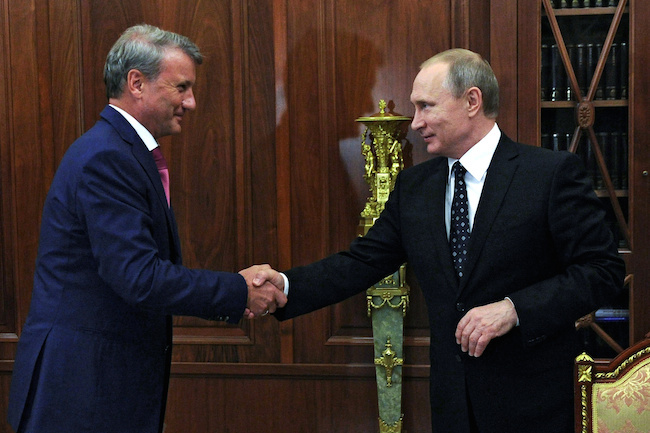 Sberbank was once known informally as the “KGB bank,” and now has a reputation for close ties to Russian President Vladimir Putin and to Russian intelligence services. John Schindler, a former National Security Agency analyst and a former professor of the National War College, has charged Sberbank has operational ties to Russian intelligence. Sergey Aleksashenko, formerly the deputy chairman of the Central Bank of Russia and later the head of Merrill Lynch in Russia, agreed with Schindler’s assessment. “It is a long-time tradition that in any state-run bank there are people from intelligence and security services,” he told TheDCNF. “It’s not a big surprise.” Aleksashenko currently is a guest fellow at the liberal Brookings Institution. Former U.S. Attorney Joseph DiGenova told TheDCNF Podesta should have registered with the Justice Department. It’s also unclear whether the Sberbank lobbyists were truthful when they asserted the bank was facing a cash crunch because of economic sanctions. A congressional source who sat in on the Sberbank presentations said that the paid lobbyist and Elena Teplitskaya, Sberbank’s board chairman, both claimed they were facing serious cash flow problems because of the sanctions. He talked to TheDCNF only on the grounds of anonymity. Teplitskaya claimed the bank might be unable to purchase $550 million worth of aircraft from Boeing, and that it also was facing difficulty competing in Europe because of its debt. “As far as our financial results go, it was the bank’s most successful year ever. We earned a net profit of 517 billion rubles, according to Russian accounting standards,” Gef told Putin. Sberbank’s New York office did not return calls by TheDCNF.